... and European stocks jumped as investors rediscovered some confidence as corporate buybacks were set to return with a bang. The euro first dropped then jumped after reports German Chancellor Angela Merkel would step down as leader of Germany's ruling CDU party, although she would stay on as Chancellor. Meanwhile, concern over China’s slowing economy sent the Shanghai Composite lower for another day, sliding 2.2% on Monday and keeping Asian stocks under pressure. Chinese data underscored worries of a cooling economy as profit growth at its industrial firms slowed for the fifth consecutive month in September due to ebbing sales of raw materials and manufactured goods. Shares in Tokyo also ended lower after rising more than 1% at one stage. South Korea also slumped, but markets in Hong Kong, Australia and India all gained. 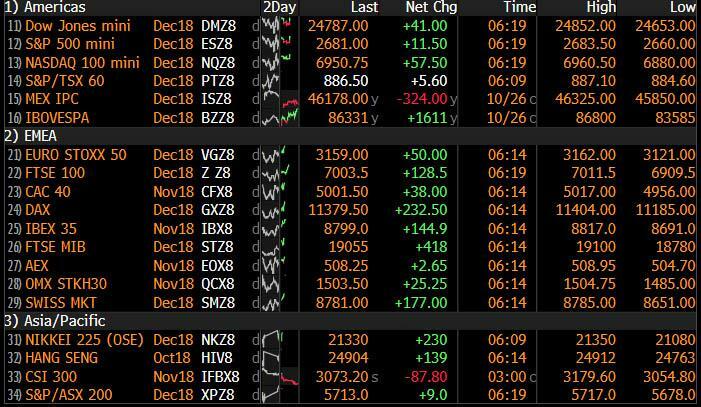 Contracts for the S&P 500, Dow Jones and Nasdaq indexes all climbed as the European morning wore on, tracking a bank-led rally for the Stoxx Europe 600 Index after HSBC Holdings Plc earnings beat expectations. Earlier in Asia the mood had been more cautious, and shares in Tokyo ended down after rising more than 1 percent at one stage. Gauges in China and South Korea slumped, but those in Hong Kong, Australia and India all gained. European shares climbed led by banks thanks to encouraging earnings reports and relief that S&P did not downgrade Italy on Friday and after HSBC Holdings earnings beat expectations, while the Stoxx 600 Automobiles & Parts index surged 3.8%, the biggest intraday rally since July 5, as China’s top economic planning body is proposing cutting the tax levied on car purchases by half. The euro first fell to a session low, then rebounded sharply, after a senior party source said German Chancellor Angela Merkel would not seek re-election as party chairwoman after bruising losses for her Christian Democrats in a regional election in Hesse. Germany's DAX was up 0.7% while the leading index of euro zone stocks rose 0.5 percent, boosted by a weaker euro. Italy's FTSE MIB led the market with a 1.5% gain after Italian bond yields fell sharply to a one-week low following Standard & Poor's decision to leave Italy's sovereign rating unchanged at BBB, sparking relief there was no ratings downgrade, even though it lowered the outlook to negative from stable. With risk gradually returning to markets, core European bonds turned lower alongside Treasuries. The dollar jumped while gold dropped. Oil fell toward $67 a barrel as traders assessed mixed supply signals. 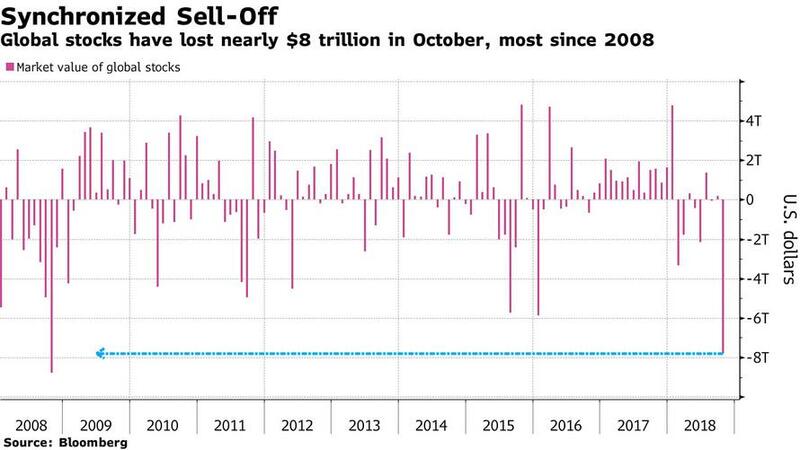 Today's risk-on session caps a torrid month in which global stocks have lost almost $8 trillion of value, and are set for the biggest wipeout since the height of the financial crisis a decade ago on concerns ranging from peak earnings growth and the U.S.-China trade war to the end of easy money and rising rates. 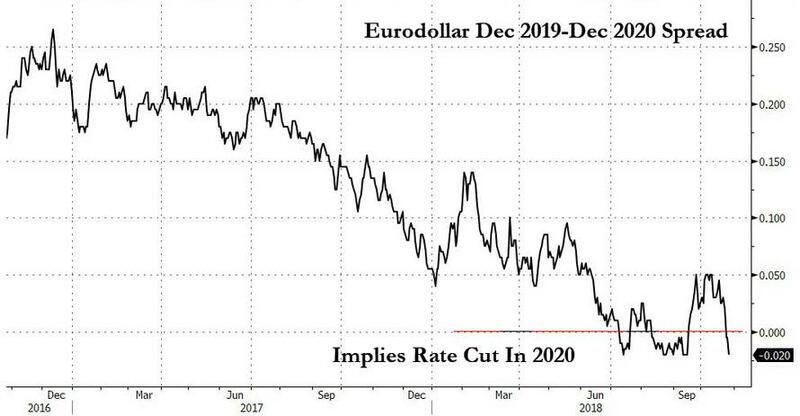 As discussed last Friday, traders have slashed bet for more Federal Reserve hikes for next year, with markets now expecting less than two quarter-point increases in 2019, compared with three projected by policy makers, and a rate cut in 2020. Emerging markets stocks were a bright spot, gaining 0.1% in their first rise in five sessions after far-right candidate Jair Bolsonaro won the second-round runoff in Brazil’s presidential election. Brazil-exposed stocks in Europe climbed as investors cheered the win. Blackrock’s Latin American Investment Trust London-listed shares gained 7.4% while a Germany-listed iShares MSCI Brazil ETF climbed 6.6%. Despite gains on Monday, investors remain wary of betting the farm on a turnaround in risk: "The only way I can summarize the core sentiment among the European investors I met is something like ‘pretty grim’," wrote Erik Nielsen, group chief economist at UniCredit, in a note to clients. Today is the presentation of the UK budget and it may have an impact on several sectors, with pensions and bookmakers most likely to face some pressure. Banks, retailers and homebuilders will also be closely watched. In FX, the dollar index rose 0.2 percent to 96.553 after gaining 0.7 percent last week. The euro fell 0.2 percent to near a two-month low at $1.1381. Sterling fell 0.2 percent, holding near a two-month trough of $1.2775 ahead of Britain’s annual budget due later on Monday. Finance minister Philip Hammond will likely urge his divided Conservative Party to get behind the government’s push for a Brexit deal, or put at risk a long-awaited easing of austerity. Mexico’s peso slumped more than 1% after a vote to scrap a $13 billion airport. In commodities, oil also reversed early gains to dip on growing worries about Chinese growth. U.S. crude fell 58 cents to $67.01 per barrel and Brent crude slid 71 cents to $76.89. European equities are kicking off the week on the front-foot, despite the downbeat tone in Asia. As such, Eurostoxx 50 (+0.8%) is supported mostly by the financial sector following optimistic earnings from HSBC (+4.6%), which saw the likes of Intesa Sanpaolo (+3.2%), Deutsche Bank (+1.7%) and RBS (+4.1%) higher in tandem. Elsewhere, Europe’s auto stocks index (+3.9%) rose sharply following reports that Chinese regulators are said to propose a 50% cut to car purchase tax. Subsequently, DAX 30 outperforms as the index is buoyed by shares in Daimler (+5.4%), BMW (+5.2%) and Volkswagen (+5.1%). Finally, Euronext is experiencing problems in which the CAC and AEX remain halted until the technical glitches are resolved. Asian equity markets began the week mixed as the region’s attempts to pick itself up following last week’s stock rout, waned heading into this week’s key earnings releases and month-end. ASX 200 (+1.1%) and Nikkei 225 (-0.3%) were both initially positive in which the healthcare sector led the broad upside in Australia, while the Japanese benchmark was less decisive as earnings dominated news flow. Elsewhere, Hang Seng (-0.2%) and Shanghai Comp. (-2.1%) were subdued with the mainland worst hit following softer Industrial Profit growth and a net liquidity drain by the PBoC, while this week’s key earnings including China’s big 4 banks further added to the tentativeness. Finally, 10yr JGBs were choppy as prices reflected the indecisiveness across stocks and eventually edged higher as the risk tone in Japan deteriorated. In FX, NZD/AUD/CAD - All performing well vs their US counterpart to varying degrees, with the Kiwi outpacing and bouncing firmly from overnight lows to 0.6555 vs circa 0.6500 amidst a broad upturn in risk sentiment, while Aud/Usd struggles around 0.7100 and the Loonie pivots 1.3100. GBP/EUR - Both choppy, but the Pound relatively rangebound ahead of the UK budget and following mixed data, as Cable hovers above 1.2800 within a tight 1.2805-40 range. However, the single currency has been whippy between 1.1360-1.1415 trading parameters amidst reports that German Chancellor Merkel will not stand for re-election as CDU head after serving out the current term, but would like to remain as Chancellor in wake of another chastening regional result for the coalition. However, Eur/Usd has bounced firmly ahead of hefty option expiry interest at the 1.1350 strike (1.5 bn) and a sharp rally in EU auto stocks on China’s cut in purchase tax to 5% from 10%. CHF/JPY - Victims of the improvement in risk appetite, with the Franc just off parity-plus lows and Jpy retreating from circa 111.80 to 112.25 amidst similar reversals in cross pairings. EM- Broad gains in regional currencies vs the Usd, but with the Mxn a notable underperformer on disappointment that Mexico will not pursue plans to build a new airport. Looking ahead, it will be interesting to see how the Brl reacts to Bolsonaro’s resounding 2nd round win vs a flattish close on Friday. In commodities, WTI and Brent are both down by around 0.3% amid concerns that global growth is slowing, particularly in China, and that ongoing market uncertainties are leading to a downward pressure on prices. Of note with the Iranian sanctions, it is imminent is that India, China and Turkey, three of Iran’s top five customers, are resisting pressure to completely end purchases; citing a lack of worldwide supply for this. Over in the metals market, gold is down by 0.2% as the yellow metal moves inversely to the USD, although still in a relatively tight USD 5/oz range as market concerns still remain over upcoming US earnings, trade tensions and a slowdown in global economic growth. Elsewhere, the head of the Japanese steel industry group stated that he is worried about the weakening Chinese economy. Copper’s gains have been cut after a slowdown in industrial profits indicate that China’s economy is losing steam, affecting demand for the metal. I suspect if markets ended up this week being as boring as watching paint dry it would be a welcome relief for many investors. So that brings us to what to make of last week’s sell-off? As you’ll see later it doesn’t feel right to blame it on the current earnings season as this looks fine. However there does seem to be increasing fears that the profit outlook is going to be more challenging than was perhaps anticipated a few weeks back. In terms of other catalysts, the sector breakdown in the sell-off doesn’t really suggest it’s about fears of higher yields but it does suggest that it might reflect fears of a weaker global economy going forward as defensives have outperformed cyclicals (see comment below and graphs in today’s pdf). So this is probably a good buying opportunity if you think the global economy is fine for now and that earnings will hold up. It also a good time to buy if you think that October is just a freakish month that like with Halloween attracts and magnifies scare stories if there are any about. The record after mid-terms is also positive historically. However we should all know by now that US equities are valued at one of the most expensive levels in all of history assuming you mean revert all the valuation components. Anyone wanting confirmation of this should look at our long-term study from last month (see p38 from the link here )that showed that if you mean revert everything, real returns in the S&P500 will be a very weak -5.0% p.a. over the next decade vs the century plus average of +6.7% p.a. However markets don’t often turn because mean reversion say they should. A personal view that has driven our 2018 strategy is that with the stage we’re at of the Fed tightening cycle, with global QT now in full force and the US yield curve flattening, it is the perfect breeding ground for more volatile and difficult markets even if the cycle holds. So we continue to think volatility should remain structurally higher than the 2013-2107 calm even if the global economy likely has at least another 12 months of decent growth ahead. The area we have got wrong this year is core European yields. We still think they are completely mis-priced but wonder whether we can be right on this going into next year if our view on regular bouts of vol continues to prove correct. Bunds seem to be a lightning conductor for any risk off. A view to resolve before our 2019 outlook is published. This morning in Asia, markets are off to a mixed start with Nikkei (+0.41%) up while, Hang Seng (-0.07%), Shanghai Comp (-1.47%) and Kospi (-0.20%) are all down. Overnight, Japanese news daily Asahi reported, without citing anyone, that the BoJ is set to discuss measures to make trading of JGBs more active at its policy meeting to be held this week as the BoJ’s current policy is causing activity to shrink. The report also added that the BoJ will consider delaying purchases of long-term JGBs until two business days after the Ministry of Finance’s auctions and will discuss reducing the frequency of mid- and long-term bond purchases. The reaction in 10y JGB yields has been muted with yields up +0.4bps to 0.103%. Yesterday we saw the Hesse regional election in Germany where the CDU won 27.2% - down from 38.3% five years ago. The SPD won 19.8% and the Greens 19.6%, with the SPD down from 30.7% five years ago and the Greens up from 11.1%. The far-right AfD achieved 13.2% per cent (from 4.1%) - taking it into the Hesse regional assembly for the first time as expected. This is less about the AfD for now though and more about Mrs Merkel’s future and that of her national level coalition. SPD head Andrea Nahles said as the projections came in yesterday that “the condition of the government is not acceptable,” while adding the government needs a short-term policy road map and its implementation will determine whether the coalition still is “the right place for us.” According to our German political experts’ (Boettcher & Braeuninger) piece last week, this type of result seems to put us into the scenario where Merkel might come under pressure to refrain from running again as the CDU leader at the party convention on Dec. 6-8. Among the SPD, these losses might fuel even more reservations about the Groko. Thus, Merkel’s government could become even more fragile. So at a time when Europe needs a strong Germany there is much domestic political uncertainty. Chancellor Merkel is set to address the election results today while, CDU general secretary Annegret Kramp-Karrenbauer has stated that Merkel will run again for the party leadership at the CDU national convention. After markets closed on Friday, S&P downgraded Italy’s ratings outlook to negative, but maintained their BBB status. This was a positive surprise, as the agency could have followed Moody’s in downgrading Italy to the last notch of investment grade. We mentioned on Friday that S&P could indeed keep the rating unchanged as they didn't previously have Italy on negative outlook and they’d only upgraded a year ago so a complete about turn was less likely. However a cut was still slightly more likely. Ahead of this BTPs traded in a somewhat wide range of 34bps on the week but ultimately out-performed notably given their risk profile in a risk off week to close -3.7bps lower as the EU and national authorities continue to negotiate on Italy’s 2019 budget plan. Staying with Italy, Il Messaggero reported that the Italian Premier Giuseppe Conte is seeking to mediate between the Italian government coalition partners and the EU over the budget standoff and has indicated that among proposals for compromise Italy will place €17bn earmarked in the budget for the citizens income program and for reform of the pension system in a separate fund as a “standby,” and then the funds would be attributed to the relevant programs “only if the situation permits it.” In the meantime, the paper also reported that the Italian government is also working on a proposal for a possible “re-modulation” of the citizen’s income program which could bring Italy’s budget deficit down to 2.3% from 2.4%. So, lots bubbling up in the background. Yesterday, in Brazil, far right candidate Jair Bolsonaro won the Presidential run-off election securing 55% of votes defeating the Worker’s party candidate Fernando Haddad who got 45% of votes. Brazilian assets should rally today as Jair Bolsonaro is viewed favourably by the markets. He is set to assume the office from January 1st. Recapping last week now, and global equities ended the week on a down note, at or near their weekly lows. The S&P 500 was down -3.95% (-1.74% on Friday) and dipped back into negative YTD territory again by the end of the week. The index also dipped into ‘correction’ territory on Friday, briefly trading below -10% down from its all-time peak on September 20. This came despite a strong GDP print that showed the economy grew at an annualized pace of 3.5% qoq in the third quarter, beating expectations for 3.3%. All S&P 500 industry groups traded lower with losses led by energy (-7.06% on the week and -0.78% Friday) and financials (-5.24% on the week and -1.35% Friday). In the pdf today we show charts of the full sectoral performance in the US and Europe last week and over the course of the recent selloff since early October. In short defensives have notable outperformed cyclicals suggesting that the sell-off may be as much a fear about the global economy than anything else. Indeed a sell-off which might have started with higher yields, is not seeing a sector performance suggestive that this is now the main concern. Anyway see the link at the top of this piece for what are interesting charts. All other major indices also traded lower, with the NASDAQ down -3.59% on the week to close in correction territory (-11.01% from its peak, and -2.34% Friday). The FANG index traded in a wide 6.53% range on the week, but actually closed only -0.11% on the week (-1.68% Friday). The DOW shed -2.97% (-1.19% Friday). In Europe, the STOXX 600 dropped -2.46% (-0.77% Friday) to its lowest level since 2016 and banks were down -4.10% (-3.40% Friday). Bourses across the continent traded lower as well, as flash PMIs printed softer-than-expected, with DAX underperforming down -3.06% (-0.94% Friday). Sovereign bonds rallied across the globe, with 5-year Treasuries and 10-year JGBs rallying -13.4bps (-4.7bps on Friday) and -3.6bps (-0.4bps Friday) respectively on safe-haven flows, their best weeks since April 2017. Ten-year Treasuries rallied -11.3bps (-3.7bps Friday), while Gilts outperformed closing down -19.3bps (-5.8bps Friday) – their best week since immediately post-Brexit – after the FT reported that tax receipts will surprise to the upside ahead of today’s budget announcement, potentially resulting in a reduced government borrowing requirement. The dollar gained +0.62% on the week (-0.38% Friday), the euro shed -0.90% (+0.31% Friday), though the safe-haven yen was the best-performer among major currencies, up +0.65% (+0.54% Friday). Emerging markets were mixed, with the Brazilian real up +1.80% (+1.53% Friday) ahead of yesterday’s Presidential runoff election and the Turkish lira up +0.91% (+0.81% Friday) after the central bank held rates steady but signaled a willingness to act in the near future. Earnings season is well underway now and was a huge focal point last week with some big swings on beats and especially misses. We’ve now seen 48% and 39% of S&P 500 and STOXX 600 companies report. US companies are actually outperforming in-spite of some big headline misses, with 82% of companies beating on earnings numbers and 58% beating on sales (versus recent historical averages of 73% and 57% respectively). Aggregate profits and revenues are up 23.7% and 8.8% yoy respectively, eclipsing expectations by 6.2pp and 0.8pp (the historical average is to beat expectations by around 3.4pp for profit and 0.3pp for revenues). The main issue for this US season is that some have started to bring their 2019 numbers down - albeit from still elevated growth rates. However this has certainly be blamed for part of the recent sell-off. In Europe, only 47.8% of companies have beaten expectations on earnings and 55% on sales, compared to historical averages of 50% and 54%. It’s a busy Monday. In the UK, we get September net consumer credit, mortgage approvals, M4 money supply and October CBI retailing reported sales along with Italy's September PPI. There is no other data release in Europe. In the US, we get September’s PCE deflator and core PCE along with September personal income and real personal spending data releases, and October Dallas Fed manufacturing activity index. Late night, we get Japan's September jobless rate. Away from data, the Fed's Evans will be speaking at an event and the UK's Chancellor of the Exchequer Philip Hammond will present his budget. The WTO's dispute settlement body is also set to consider a US request to investigate possible violations related to China’s intellectual property policies. In addition, Mondelez and HSBC will report their earnings.